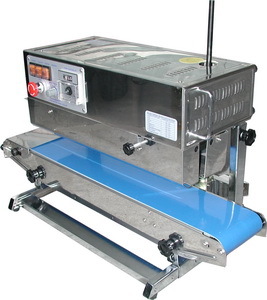 This Portable Vertical Band Sealer is ideal for packaging bags that contain spillable items such as powders, liquids, grains, etc. Conveyor speed up to 40 Ft. per minute. Unit has the optional capability of imprinting as well as sealing. It's portable and completely adjustable for height, heat and speed. Comes equipped with a repair kit. Embossed printing wheel and set type optional.